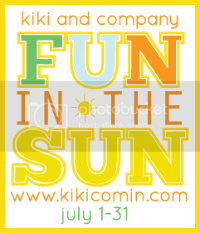 kiki creates: Did you know it was mine? Did you know it was mine? Ahhh! What a fun week. It has been SO busy, but so fun. 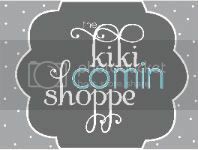 If you are new to kiki creates..welcome! Feel free to browse around and stay awhile! Take a look at the pictures..enjoy some of the details, and then if you have ANY questions or want to see a tutorial of something, let me know in the comments! I was completely inspired by a duvet cover I saw at Urban Outfitters that rang in at $198. Not in my budget, but a $28 sheet set and $6 worth of sheets, tablecloths, and bed skirts from the thrift store and voila, I had a fun and fashionable duvet cover. I used my left over ruffles and hand stitched them to my previous bed skirt. I bought $8 worth of clothes and turned them into fun pillows for my bed and then with 4 shutters that cost just $5, I made a beautiful new headboard. After strolling through the dollar store and finding a braided wooden wreath and fake birds, I took a book from the thrift store and wrapped it and made some sweet hand cut flowers for the wreath. I spray painted the bird and it completed the look! What started as a BLAH bedroom turned into one sweet abode to be in with a lot of work and a little money. I love this shot of the headboard. It was really so simple to make, but makes a big impact in the room. and my take on it: $34. much better. I will be doing a little Q & A about the duvet cover..and show you where I got my inspiration for the ruffle bed skirt. If you have any questions about how I made it, what it is made out of, sewing it, etc..ask away in the comment section. I did 3 different ruffles to give it a more full and unique look. Thank you for again voting for me. I so appreciate this fun opportunity and CAN'T wait to show you next weeks project! A shout out to Melynda for her incredible skills in photography and Becky's sweet teaching of crown molding cutting...I am learning a lot of new things...love that! If you love this post, and I hope you do, become a follower. Headboard and wreath tutorials are still coming! Wow, that's amazing! I love what you've done, so creative! Love the headboard and the flowers made from book pages. Ha ha! I was totally right! It had your name written all over it. Awesome Kiki! wow, I love the ruffles and the pillows! so gorgeous and NOT at ridiculous prices!! Oh yeah, I knew. How could you not - it screamed your name. Way to stay true to yourself - plus now you have an awesome bedroom retreat - for cheap! Congrats, this was an amazing makeover. I would love love love to know how you created the duvet. Did you buy the plain duvet or make it? Tutorial please! woooowwww Kiki you are amazing! I kept wanting to vote and didn't! But I am following! love love your ideas!!!! can i please get a tutorial or something on how to make that duvet cover? thanks...and can't wait to see more of your ideas!!! Oh, I LOVE LOVE LOVE this project, and voted for it! If I could have voted for your project all three times I would have, it is SO cute! I would love to see a tutorial and pictures of the sheets and tablecloths you used to make the duvet and a tute for the pillows. I am especially in love with the blue ruffly one. Congratulations, I can't wait to see next weeks project! I voted for you eventhough I had no idea it was you. I love what you did! I have been eyeing that bedspread for quite a while. So awesome!!! It is beautiful!!!!! Just amazing!!! You have such talent! I LOVED all of the photos! WOW! Good job with all those ruffles! The duvet is absolutely beautiful and the pillows add such a fun pop! The question is, what DON'T I love about our bedroom makeover?! Wow. It turned out beautifully. I love everything. The details are lovely. Every last one. i fell in love with this when i saw it and voted!!! 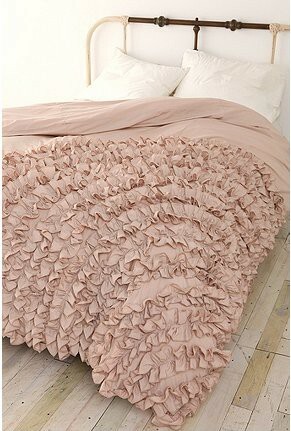 I have wanted a solid color bedspread, but love the texture the ruffles add!!! what type of fabric did you use to make it so inexpensive? king sheets? also, didn't really notice the pillow before, but LOVE the US map with the heart!!! 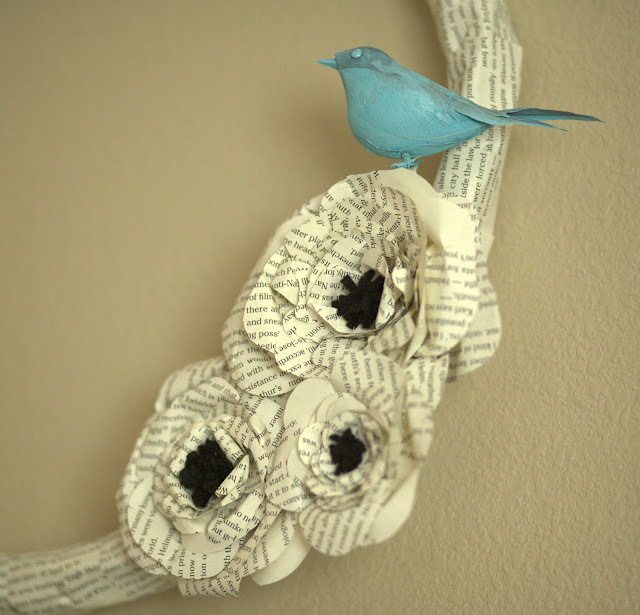 I would LOVE some tips on making a wreath like yours here - and the paper flowers. Hey! 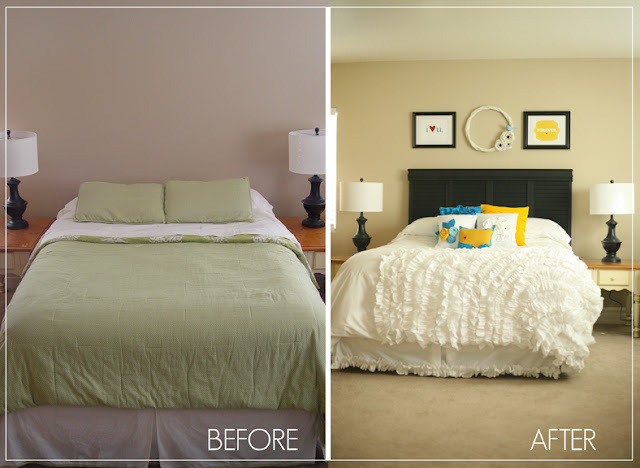 Love the bedroom redo! & especially the duvet cover. I've been keeping my eye on the one from Urban Outfitters, as well. Anthropologie also has a couple similar ones as well. While I can't wait for your tutorial for the duvet, I would LOVE it if you could do a tutorial for the newspaper flowers on your wreath. I'm planning a country chic baby shower and I found some great inspiration pictures of gift bags with very similar flowers. For some reason, I cannot figure out how to make them! LOL. Other bloggers have even tried to be like "You just cut out the petals and fasten them together!" UGH... lol. Here's the link to the picture of the gift bags if you want to check it out! Kiki you are sooo talented! The bedroom looks amazing, duvet, pillows, pictures, everything! Love it. Love, Love, Love your room! So many details, so many great ideas! I SOOO voted for you! I am so excited that you linked up! Thanks for joining the party! Please please please do a tutorial on how you made the duvet! Especially how you did the ruffles! Wow, that is awesome! Great Job. Such Creativity. wow!!! I've been looking for a new color scheme or our bedroom. . . thank you for the inspiration! What a fantastic, thrifty, creative job! I LOVE THIS!!! I WANT TO KNOW HOW YOU MADE EVERYTHING, TOO! ESPECIALLY THE BED COVER WITH THE RUFFLES. BEAUTIFUL!!! What a beautiful makeover! Thanks for sharing and inspiring all of us. Even though I am such a beginner at sewing, I feel like I can transform my masterbedroom now too! I would love to see any and all tutorials on how to get a similar look. Great job! YES - THAT DUVET IS fabulouishousness! uh huh - that good. I've been on the hunt to be able to make a couple for my daughter's room. Tutorial coming that a non-expert sewer might be able to swing? love love and wanna make make make! Can't WAIT! Did you make the US felt pillow too? Can you post a tutorial for that. I love it! I absolutely love it! Definitely going on my project list! 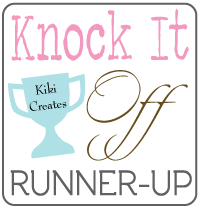 Kiki - you made it to the Top 10 Round in the Knock It Off contest but I do not have your email. Please send me an email at 733blog@gmail.com so I can send you the specifics! Voting begins today! I love the duvet cover!!!! I am in the process of decorating my room and have been looking for something and I think this hits the mark! Please put up a tutorial!!!!! Oh, can I add I LOVE the price!!!! Did you make the pillows? Do you sell them if you do?? I so want some!!! So, So Cute. I've been lusting after the UO one for ages, I just couldn't bring myself to cough up for the shipping to my country. I would LOVE for you to post a tutorial!!!!! Pretty please!!!!!! I absolutely love, love, love what you did!! It is so gorgeous and it is the answer to all my questions of what to do with my incredibly boring bedroom. I am really interested in a tutorial on how this was done. Pretty please! Thanks for all the sweet comments. You can look on my sidebar or click here to see the tutorial! I would love to vote for you... where do I do that? How is it that you made the ruffles? Were they self made? Or pre made? 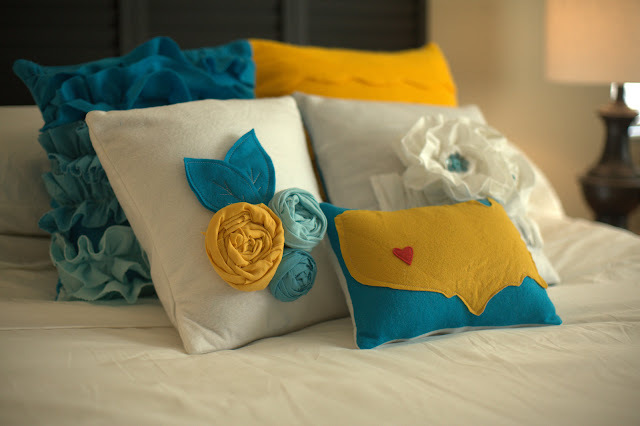 How did you attach the rosettes to the pillow? Do you have a tutorial for the duvet? I seriously want to make one! Do you have a tutorial for the duvet cover? I really want to make it!